Three new lift terminals set to form a gondola hub near Walt Disney World’s Caribbean Beach Resort seen earlier this month. The big Disney Skyliner story last month came from a Twitter user stuck in traffic within Walt Disney World. He or she (the account belongs to a golden retriever) happened to get behind a gondola cabin on a trailer which looks to be a CWA Omega IV 10 passenger D-Line model with extra ventilation and reflective windows. It’s our first real glimpse of what the hundreds of cabins for the Disney Skyliner system might look like. Before I get into a construction rundown, the video below shows a new Doppelmayr gondola in Turkey that appears to allow carriers to come to complete stops for loading and unloading while the haul rope keeps moving. In this installation, many of the carriers are buckets carrying ore that must be stopped to fill and dump while others carry workers and go through a standard turnaround. With double turnarounds at both ends, the setup appears to be similar to the six double loading stations going up at Walt Disney World. The Epcot International Gateway Skyliner station is progressing with the concrete masts in place and steel beginning to go on top. The first tower next to the station isn’t up yet but the next one is painted green to blend into its surroundings. The ten or so towers between Epcot and BoardWalk have been up for awhile now but legs for the first angle station are new. Remember, this is not actually a loading or unloading point but rather a pass-through station. Soon, there will be steel here too. Look how big the combo assemblies are coming from Epcot! Most of the towers are also now standing between this line’s two angle stations along Buena Vista Drive. It looks like there are a couple still left to put up near the BoardWalk turn station. Gondolas will pass by a Speedway gas station and firehouse on their way towards Caribbean Beach. 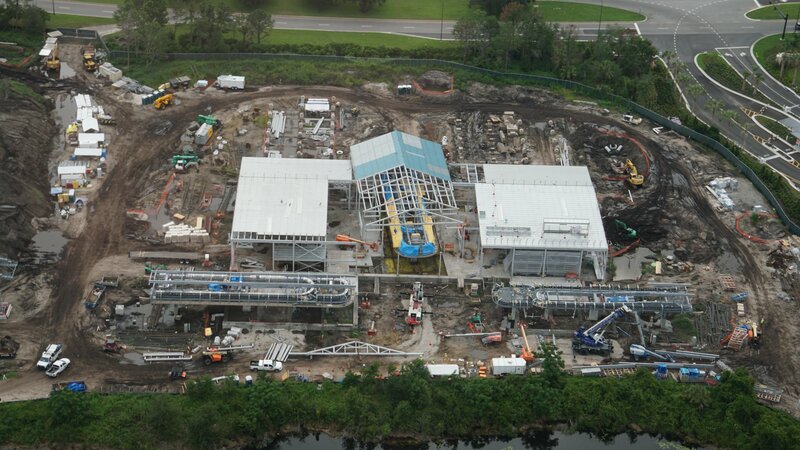 Before the hub is the upcoming Riviera Resort, a hive of activity with a three bullwheel angle station taking shape. This is looking like the only doors-open station without double loading for special needs passengers. We still don’t know about colors and theme but the dark green trumpets give an idea. Anyone have a guess whether this station will have a full enclosure or just some covers over the tire banks? All of the tall towers in Caribbean Beach Resort are up, which brings us to the south end Skyliner hub. Three gondolas will meet here with a single roof overhead. Assembly of the lift components is almost complete with the rest of the complex taking shape. Cabin parking and maintenance bays will also be located here. The second line branches off to Hollywood Studios, where some of the first towers were set a few months ago. Hollywood Studios station is the furthest along of the eight D-Line terminals. The ends have been capped with cladding unique to Walt Disney World. Red trim is going on to complement the light green structure. The hold down tower next to the Hollywood Studios station is also now up and painted in a different shade than the rest of the galvanized towers on this line. Beige? For the Pop Century/Art of Animation Resort line, half the towers are still yet to be raised in Hourglass Lake. The return station is in the middle of a bridge connecting the two resorts, where a pier now supports a loading platform and gives an indication of the double loading station geometry. It looks like this will be the final station to be assembled, even though this line got the very first Skyliner tower back in February. As we mark one year since the Skyliner project was formally announced, around eighty percent of towers and six of eight stations are being assembled. The system is somewhere around a year from opening but if you can’t wait to ride a D-Line outside of Europe, Big Sky Resort will be first in North America even sooner. Looking great! Its crazy how we are going from zero to four D-Lines in North America in one year! Exiting times! D-Line is going from zero percent North American detachable market share to ~20 percent this year. UNI-G will be 50 percent and LPA 30 percent. Last year was 50/50 UNI-G/LPA and the year before 60/40. It will be very interesting to see how 2019 shakes out and if/when Doppelmayr phases out UNI-G. I think the uni-gs is going away as it better suits the North American market also the D-line is premium product so I could see the uni line continuing for some time. The last UNI-GS was built in 2010.